For those going through the chemotherapy process, these moisturizing products may be soothing for dry sensitive skin, cracked lips, and brittle nails. 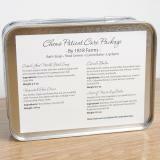 These items are packaged in a reusable metal tin and wrapped using a rustic rope and ribbon. Great. Thought it was going to be bigger though.